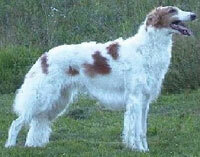 Borzoi Dogs - The Borzoi is a breed of dog also called the Russian Wolfhound. They have medium-length, slightly curly hair and are similar in shape to Greyhounds. They are a large variety of the sighthound family. This information is licensed under the GNU Free Documentation License. It uses material from the Borzoi article on Wikipedia.org. Borzoi Breeders - Advertise your kennel puppies and dogs here. Alisdan Kennel - Romania - Andrea's Sighthounds in Romania: Afghan Hound, Borzoi and Irish Wolfhound. Our hounds are family members. We show for fun and we breed for quality.